Call Option is the right to buy something (= underlying asset). If you are trading call options on equities (common stocks), it means you are trading the rights to buy the stocks on a certain day for a certain price. 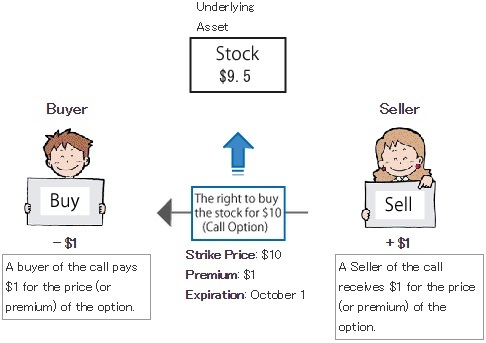 The above example of a call option shows the right to buy certain stocks for $10. This price for which the option gives you the right to buy is called Strike Price. The price of the option itself also has a name -- Premium. Additionally, every option has Expiration. For the above example, the expiration date is set to be October 1. In summary, this call option is "the right to buy the stocks for $10 per share on October 1". There are two basic styles of options with regard to how the right is exercised -- American-style and European-style. Although the options on stocks are American-style in the real stock market in America, we apply European-style options to the examples to facilitate learning. So an option has three things. Strike Price, Premium, and Expiration. Am I correct? Yes. Let's take a look at how traders buy and sell the call option. Suppose that the stock is trading at $9.5 on September 1 when the option is traded. A buyer of the call pays $1 for the price (or premium) of the option. A Seller of the call receives $1 for the price (or premium) of the option. In this example, the call option was traded for $1 on September 1. This option's strike price is $10 and the expiration date is October 1. So the buyer of the option bought "the right to buy the stock at the price of $10 on October 1". Am I correct? Here, you need to know the difference between the buyer and the seller of options. A call option gives the buyer the right, but not the obligation, to buy an underlying asset at the strike price. On the other hand, the seller of a call option has the obligation to sell an underlying asset at the strike price when the buyer exercises the option. I don't understand selling a option. Where does the option come from in the first place? Do you have to borrow it from a broker like you borrow the stocks when going short?? When you sell an option, you don't need either have it or borrow it from anyone. In other words, you can sell what you don't have in options trading. This may sound strange at first, but think about what insurance companies do. They write the contract of insurance out of nothing and sell it to their customers. As a result, insurance companies receive insurance premiums, but they have to pay the cost of losses when something goes wrong. The contract of options is basically the same. A seller can just "write" (which is an alternative term for "sell") options out of nothing, with the obligation to pay the cost when the price of the underlying asset moves against the position. That sounds interesting. I want to know more about trading. OK. Let't see what happened one month after the above trade. The result can be summed up simply as follows. The buyer wins and the seller loses if the stock price rises above $11. The seller wins and the buyer loses if the stock price stays below $11. 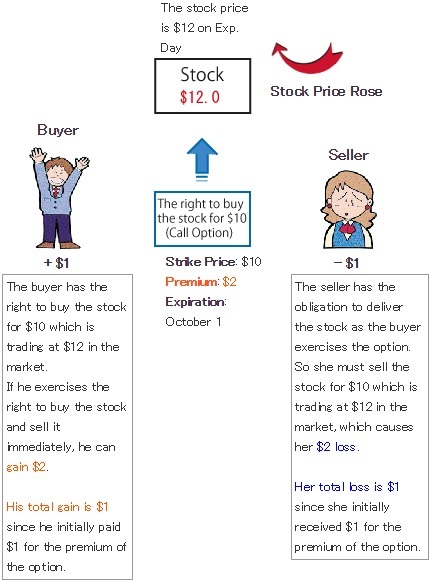 The buyer has the right to buy the stock for $10 which is trading at $12 in the market. If he exercises the right to buy the stock and sell it immediately, he can gain $2. His total gain is $1 since he initially paid $1 for the premium of the option. The seller has the obligation to deliver the stock as the buyer exercises the option. So she must sell the stock for $10 which is trading at $12 in the market, which causes her $2 loss. Her total loss is $1 since she initially received $1 for the premium of the option. As you can see, the buyer wins and the seller loses if the price of the stock (underlying asset) rises sufficiently before the expiration day. In the real stock market, 1 call option contract gives you the right to buy 100 shares of stock. Similarly, the total loss of the seller would be $100 in the real market. I guess I got hold of the trade. But buyers of options don't always win, do they? Now let's see the case where the stock price didn't rise after the first option trade. The call option has no value at this point because no one wants to pay $10 for what anyone can buy at $9.5 in the market. He can just let it expire worthless. His total loss is $1 since he initially paid $1 for the premium of the option. This option has expired worthless. The seller doesn't have to do anything because the call option has expired worthless. Her total gain is $1 since she initially received $1 for the premium of the option. 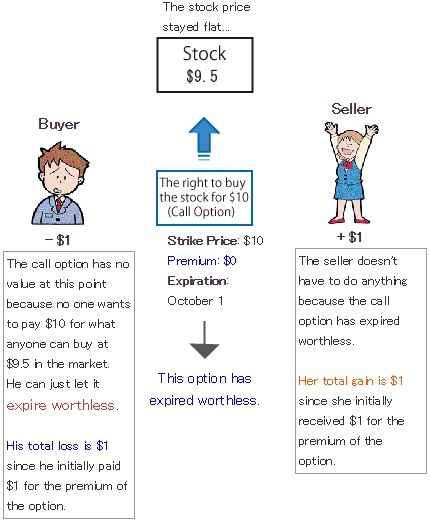 The buyer of the option has "the right to buy the stock for $10", but the stock price didn't changed from $9.5 since the option was initially traded. Who wants to exercise the call option and pay $10 for the stock that anyone can buy for $9.5 in the market? So the buyer can just let the call option expire worthless because a buyer of options has the right, not the obligation, to buy underlying assets at the strike price. The call option was initially bought for the premium of $1, but it turned out to be $0 or worthless on the expiration day. That's why the buyer of the option lost money in this trade. The seller is able to keep $1 which was initially gained by selling the option, finishing the trade with $1 profit. In the above example, $11 (for the stock price) is the break-even point on the expiration day for both the buyer and the seller of the call option . Let's take a look at the profit/loss graph for the buyer. It looks like the loss is limited to the initial premium. But the profit can be larger as the stock price rises. Next, let's take a look at the seller's graph. The profit is limited to the option premium, but the loss seems to have no limits if the underlying asset surges. There is something noticeable about the P/L for the seller. The above graph shows that the seller can gain profit even if the stock price doesn't change. As I mentioned in the 1st lesson "Advantages of Options", this is one of the biggest advantages in options trading -- making profits in sideways markets. I remember that. There is no way to make money in sideways markets if you just trade stocks. There is even more in selling options. When you sell an option, you can make a profit even if the price of underlying asset moves against your position as long as the movement is small. In the above example, the seller can gain a profit even when the stock price rises as long as it doesn't surpass $11. I understand your point. But buying options seems more reasonable. When you buy an option, your risk is limited and you have unlimited profit potential. That is one of the most misunderstood concepts in options trading. The fact is, however, it is hard to say which side is better, buying or selling, because "the chance of winning" in selling options is much higher than that in buying. There are statistics showing that 80% of options traded in the market expire worthless. One way to put it is that buyers of options lose their money in most trades, but they occasionally make a fortune with a profit many times larger than their initial investment. Sellers can often earn profits, but in the event of market crashes or some other wild movements of the underlying asset, they may suddenly lose all that they have gathered little by little. If you want to play the game of options well, it is important to find "an edge" in trading. We have only looked at the cases where the buyer kept the call option until the expiration date to exercise it. What if, however, the stock price surged before the expiration and the buyer wanted to "realize" a profit beforehand? In such case, the value (premium) of the option rises, so you can just resell it and gain a profit. The value of the option rises as well. Really? So I can make money before the expiration day? In fact, buyers of options benefit from reselling them when the premium gets higher rather than just waiting until the expiration date to exercise them. The reason was discussed in Advantages of Options -- the advantage of leverage. You need small amount of asset to make a large profit. Another reason is related to "the time value of options" which we will learn in the later lesson. So traders buy and sell options. Now we are talking Option Trading! Remember that it's up to you wheather you exercise an option and trade underlying assets or buy and sell options themselves. You have a wide range of options in options trading. From sellers' points of view, they may want to avoid facing the exercise of options after the stock price surges. In this case, the sellers can buy the options back before the expiration date and offset their positions. Unfortunately, sellers will suffer losses because the premium of the option is already higher as a resul of the rise in the stock price. But buying back is often necessary for them to keep the loss under control and manage the risk. I've heard risk management is vital in trading. That's it for Call Option. You certainly learned A LOT in this lesson. I appreciate your heavy work! The next lesson is Put Option. It will be A LOT easier than this time, for the only difference is "selling" the underlying asset instead of "buying". I hope it will, sir.